With the help of favourite and new characters, security guard Larry Daley travels to London to unlock the true secret that brings the museum to life. It’s a thrilling race against time to restore the tablet’s power, before it’s gone forever. Be prepared to be laughing non-stop with the third and final instalment of the museum trilogy. There are more comedians joining in the fun this time, as the usual characters go from New York to London to visit the British Museum to find the secret of restoring the corroding magic tablet so that the magic will never end. If you love the slapstick and gags from the first two films, this will be equally hilarious. – Laa, the Larry Daley-lookalike Neanderthal (Ben Stiller)- you can’t help but fall in love with this action-copying machine. – Tilly, the security guard for the British museum (Rebel Wilson)- she might be just a supporting role, but her romance with Laa is simply memorable. I really don’t mind if she’s replacing Larry Daley to be the next museum night guard! – Sir Lancelot (Dan Stevens)- it’s always fun to listen to a pompous know-it-all knight thinking that he is still in the quest to find Guinevere. – Hugh Jackman/ King Arthur- This is one of the biggest surprise of the film, to see Hugh Jackman acting as himself (a cameo), and the staged character King Arthur in the Camelot production. Watching him do the Wolverine roar without the special effects was almost priceless. But of course, some audience might find the jokes and tricks in Night at the Museum: Secret of the Tomb a tad stale and overused. And if you realised, we have to give credit to the film for gathering all the best comedians together in this film, getting them to interact with one another and including social media in the film. LOL. Go watch it for 2 hours of brainless laughter, it will be worth your money. Have fun! Owen Wilson and Steve Coogan were going to star as the same two characters Jedediah and Octavius once again in their own spinoff from Night At The Museum somewhere in 2015 before the passing of Robin Williams. Larry Daley’s son Nick Daley was played by Jake Cherry in the previous films. Here he is played by Skyler Gisondo. The film is dedicated to the late actors Mickey Rooney (April 6, 2014 at the age of 93.) and Robin Williams (August 11, 2014 at the age of 63). There were quite a number of exhibits featured in the movie that were not from the museum. – There was no lava at Pompeii – Vesuvius erupted and buried the ancient Roman town in the deadly explosion of ash and pumice. – The two beautifully glazed porcelain ornaments, known as the Kakiemon elephants from 17th Century Japan are only 14 inches tall in reality. – Although the museum has an incredible 120 human mummies, it does not hold the Egyptian pharaoh Ahkmenrah’s tomb as scenes suggest. Check out Night At The Museum: Secret Of The Tomb Official Website and Facebook Page! 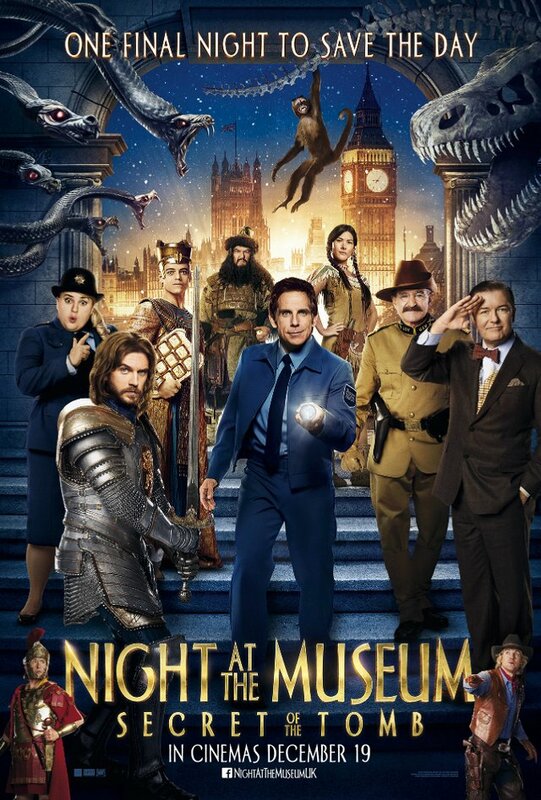 Night At The Museum: Secret Of The Tomb is out in cinemas on 25 December 2014. Planning to watch this with my siblings. When is this? I wish I could watch it! Great review! I haven’t watched this movie but now I’m watch it today. I’ve never seen the trilogy but will make sure to catch this one, mainly because of Robin Williams. I do give them credit for bringing an impressive cast of comedians together. Haven’t watch the new series of the Night of Museum movie, I enjoyed the last movie before this one, but based from your review I think it was so enjoyable and funny. I know you have read my review of this film. It is charming but not as fresh anymore. I enjoyed the Hugh Jackman cameo very much as well. I was very surprised that he was there, no one spoiled me about it. Haha! I love the NATM series because of the endless laughter scene after scene. A plus factor for watching this would definitely be Robin Williams. I’m sooo happy Fat Amy is in it too! I watched the sequel. Still, it is entertaining! Love this movie much..
Robin Williams (RIP) is a fine comedian indeed. This is surely one heck of a movie.Me and my family will watch this film. I watched it too. Not bad, its quite entertaining and hilarious. I like Ben Stiller. Haha… funny movie. Great review, looking forward to watch this. IMO, this is the worst of the NATM series. The first one was epic. And then it sort of went downhill. But I guess it’s still a must watch for all Robbin Williams fans. I enjoyed the latest Night at the Museum. I thought it was quite entertaining, however, like you pointed out, there are a few things in the movie, you don’t find in the British Museum. I’ve watched the first previous night of the museum movies. This one looks really good plus I think this should be Robin Williams last movie. I liked all the Night In The Museum movies so far (I haven’t seen this one yet though). Loved your review. And of course, it will be nice to see Robin Williams in one of his last movies.